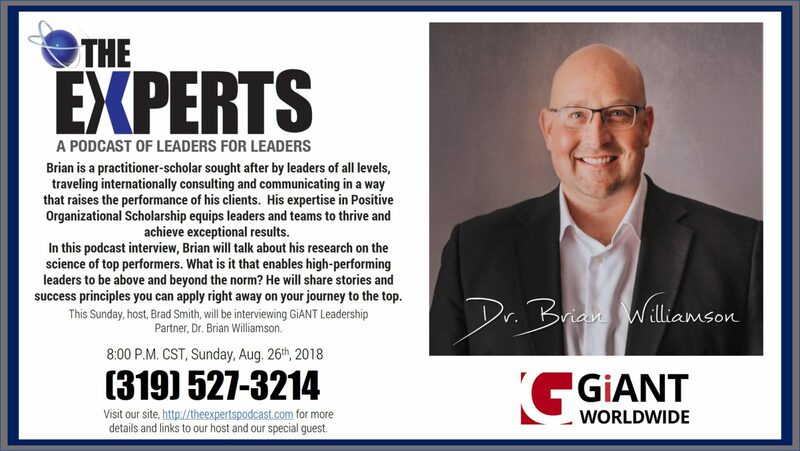 Brian is a practitioner-scholar sought after by leaders of all levels, traveling internationally consulting and communicating in a way that raises the performance of his clients. His expertise in Positive Organizational Scholarship equips leaders and teams to thrive and achieve exceptional results. In this podcast interview, Brian will talk about his research on the science of top performers. What is it that enables high-performing leaders to be above and beyond the norm? He will share stories and success principles you can apply right away on your journey to the top. LET ME START BY ASKING YOU A QUESTION: What if I was your competition and was outperforming you to the tune of 4X the profit—BUT That I would share what I do…you could build your business to achieve 4X the Profit of your competitors, would you do it? Looking at the world from the right of the bell curve…we study positive deviance: that which is flourishing, positive, and life-giving in organizations. Most leadership models have INFLUENCE at the heart of leadership. WE KNOW FROM RESEARCH: POSITIVE ENERGY trumps influence by a factor of 4. Positively energizing leader—performance of your people goes up, team, elevated performance. WHEN VALUES ARE CLEAR—DECISIONS ARE EASY!! (other focus 18, generosity 4, impact beyond transaction 4, commitment to long term relationship 3, supportive 4, sacrifice 3, example to be imitated 2, outside of the norm thinking 1). Are you for me? Against me? For yourself? WHAT MAKES THIS HARD FOR YOU AS A LEADER? It starts with a value of humanity [other focus], the value of other people [other focus]. This value in the journey of humanity [other focus] to find mutual respect [other focus] and carve out the ability to love one another [other focus]. That's [other focus] probably the value that is most deeply motivational [values driven] to me. You know for me this is the empathy [other focus] that really makes a difference [sense of meaning] a person who contributes to their tapestry of relationships. 1-HAPPY PERSISTENCE: One of the most important attributes in this is happy persistence [personal efficacy, self-determination] where I don't hate the people that are shunning me or turning me off, I go back and I have the tenacity [courage] to reconnect with them [relational connectivity], the friendships [other focus], visit with them [relational connectivity]. Keep connecting those relationships [relational connectivity] so that I can get back into the fold of being part of a team if possible [team focus]. That's been successful but the courage [courage] to do that, kind of the strength to move on [personal efficacy] it comes from outside reading [continual learning]. COURAGE TO CHALLENGE THE STATUS QUO—CONFRONT PEOPLE AND SYSTEMS. Across the board leaders who achieved extraordinary outcomes had a clear sense of purpose that was driving their life. Kim Cameron: that leaders who focus at least as much on abundance gaps as on deficit gaps produce far higher levels of performance. For example, in a study of the effectiveness of 30 units in a large health care system, the units that emphasized abundance gaps and implemented positive practices—compared to normal units that focused mainly on solving problems, treating illness, and closing deficit gaps—achieved substantially higher levels of performance over a three year period of time regarding employee satisfaction, patient satisfaction, quality of care, engagement of employees, relationships with other professionals, and employee turnover. A conscious focus on abundance gaps produced improvement in 5 both problem solving (responding to negative deviance) and flourishing (fostering positive deviance). Because all human beings have an inherent inclination toward positive energy and toward that which is life-giving, leaders who capitalize on this heliotropic tendency can produce flourishing, even in trying circumstances. 2X brain capacity positive words vs. negative..
What can you do to produce similar results? What practices made this successful? One key finding in the POS field is that a focus on the positive produces the heliotropic effect. This effect is defined as the tendency in all living systems toward that which gives life and away from that which depletes life—toward positive energy and away from negative energy. Positivity is life giving! When people flourish—commitment goes up. Plants lean toward the light, people remember and learn positive information faster and more accurately than negative information, positive words predominate over negative words in all languages, human brains are activated more by 2 positivity than by negativity—leaders that capitalize on the positive similarly tend to produce life-giving, flourishing outcomes in organizations. Your context: actually more important in circumstances that seem threatening, stressful, and worrisome. Crises, threats, inadequate resources, deterioration, and stress characterize trying times. The most frequent reaction to such conditions is hunkering down, protectionism, problem orientation, and defending against anxiety. Common human experience, as well as abundant scientific evidence, supports the idea that emphasizing the negative is necessary and adaptive in such circumstances. Positive strategies are highly effective in threatening as well as in benevolent situations. My own studies of organizations that have downsized, faced bankruptcy, experienced loss of mission, and encountered fiscal disasters have produced at least five keys to flourishing in trying times. After an exchange with this person I feel more stamina to do my work. Create positive energy in the face of decline. Recent research has found that individuals can be identified as “positive energizers” or “negative energizers,” and the difference has important implications in trying times. Positive energizers create and support vitality in others. They uplift and boost people. Interacting with positive energizers leaves others feeling lively, inspired, and motivated. In contrast, negative energizers deplete the good feelings and enthusiasm of others. They sap strength from and weaken people. They leave others feeling exhausted and diminished Positive energizing is a learned behavior, not a personality attribute. The correlation between being a positive energizer and being an extrovert, for example, is essentially zero. Being a positive energizer is not a matter of being gregarious or outgoing. People learn how to become positive energizers, and it is a developed competency rather than an inherent attribute. Positive energizers benefit their organizations by enabling others around them to perform better. In sum, positive leadership focuses on what elevates individuals and organizations (in addition to what challenges them), what goes right in organizations (in addition to what goes wrong), what is life-giving (in addition to what is problematic or life-depleting), what is experienced as good (in addition to what is objectionable), what is extraordinary (in addition to what is merely effective), and what is inspiring (in addition to what is difficult or arduous). Positive leadership means promoting outcomes such as thriving at work, interpersonal flourishing, virtuous behaviors, positive emotions, and energizing networks. Especially in trying times, this kind of leadership is rare, but it is essential if organizations are to flourish. Capitalizing on the heliotropic effect, managing economic downturns virtuously, focusing on abundance gaps, creating positive energy in the face of decline, and implementing positive practices even in industries that don’t seem to value them are all keys to flourishing in trying times. Similarly, a study 60 top management teams conducted by Marcial Losada also confirmed this finding. These teams were formally observed working on their own organizational issues for one day, and their communication patterns were coded into several categories. One category was the number of positive statements made relative to the number of negative statements made during the day. A positive statement is helpful, caring, approving, congratulatory, and so on. A negative statement is derogatory, critical, disapproving, contradictory, and so on. The performance of these top teams’ companies were also assessed based on profitability, productivity, and leadership competence. High performing companies used 5 positive statements for every negative statement during the day. Low performing companies used 3 negative statements for every positive statement. That is, when the communication of senior executives was biased toward the positive, or toward abundance gaps, performance was substantially affected. While not ignoring problems, leaders that emphasized abundance gaps produced flourishing.